Introduction – Eran (ऐरण), a small village, is situated at the south bank of river Bina, a tributary of river Betwa. Eran enjoys the status being one among the most ancient towns in India. In ancient times, the town was known as Airikina, Erakaina and Erakanya as evident from the epigraphs and coins discovered here. Eran was an important stop on an ancient route from the east towards Ujjain and from the north linking Mathura and Vidhisa19. Alexander Cunningham was the first to notice the antiquities of the town and his account was published in the Journal of the Asiatic Society of Bengal vol. clxxxi m 1847. He again visited the town during his tour in 1871-72 and this account was included in the seventh volume of his survey reports. He narrates a local legend, that assigns the foundation of the town to Raja Barat or Vairat. Bheem, a Pandava, during his exile came to this town. At the expiration of his terms of exile, he shot an arrow, named Kichak, in joy. This arrow, which was shot at a deer, instead hit the hoof of the cow, splitting that into two. However the cow survived, its wound healed immediately and since then the hoof of all cows became cloven. Witnessing this event, the king came to know the real identinty to the sojourner. Bheem left his gada and his mother’s churning stick and erected his own statue and left the town1. 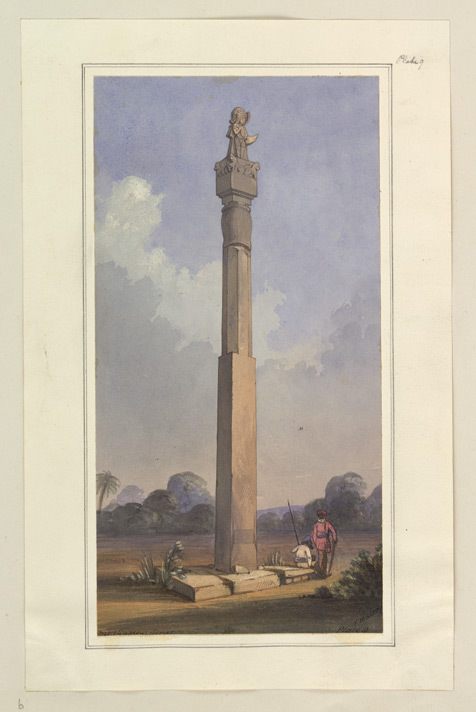 The pillar standing at Eran was known as Bheem Gada, another shorter column as his mother’s churning stick and the status of Vishnu as Bheem Sen among the locals. The most important finding of the period I was a mud defense wall and its associated moat. This wall suggests that the residents of the town were confined within the boundary marked by this wall. This wall served two purposes for the residents, first it acted as a defense machinery as the town had the advantage of a natural barrier at its other three sides, being surrounded by river Bina. The second purpose this wall served was in form of a moat which was used accommodate the access water in case of heavy rains, thus saving the town. The wall was 154 feet wide and 21 feet deep4. Among the other significant findings, a circular lead piece bearing the name of king Indragupta, belonging to period II A is the most important. A hoard of 3,268 punch marked coins is am0ong the most significant finding belonging to Period II B. This hoard and finding of other large number of coins suggests that Eran would have served as a mint during that period. Bajpai5 tells that before the conquest of the Guptas, Eran served as a mint minting coins for the local Naga rulers. Later these mints served the Gupta rulers. One copper coin, bearing the name of king Dharmapala, is counted among the earliest inscribed Indian coins, assigned to third century BCE6. An important finding of Period III is a clay seal depicting Gaja-Lakshmi icon with a Brahmi inscription. The early history of the town can be satisfactorily traced from the time of the Sakas. Eran witnessed at least two foreign invasions, that of the Sakas and Hephthalite (might be taken synonymous with the Hunas of Sanskrit). During the start of the Christian era till the middle of the fourth century CE, Eran seems to be under the rule of the Sakas and their kshatrapas as evident from a clay seal inscription which mentions Saka kshatrapa Isvaramitra and his son Simhasrisena7. On the basis of paleography, the date of Simhasrisena cannot be taken beyond 350 CE. It was the Gupta king Samudragupta who would have wrestled this territory from the hands of the Sakas as attested by his inscription found at Eran. The Saka king ousted by Samudragupta, in all probability, would be Balavarma8. Though Samudragupta was successful against the Sakas, however that success was not of a permanent nature. After Samudragupta, his sons and successors, Ramagupta and Chadragupta II, continued their battle against the Sakas. Finally, it was Chandragupta II Vikramaditya who is credited as the exterminator of the Sakas, taking the title ‘Sakari’. Ramagupta and Chadragupta II would have spent considerable time at Eran as evident from the variety and volume of their coins found at the site. Bajpai9 suggests that the episode of a Saka king demanding the hand of the wife of Ramagupta, Dhruvadevi, may have happened at Eran as we find inscriptions of the Sakas as well as of the Guptas here. Therefore Eran would be the place where the Sakas were exterminated by the Gupta king Chandragupta II. Within the Gupta period, Eran was subjected to a foreign invasion once again, and this time it was the Hephthalites (Hunas of Sanskrit) who invaded the town during the waning period of the Gupta authority. An inscription found in Eran mentions Toramana as maharajadhiraja and is dated to his first year of reign. This inscription, on a stone Varaha, refers to the erection of a temple by a Brahman named Dhanyavishnu. The same Brahman is mentioned, along with his brother as the reigning king, in another inscription where the brothers, jointly, erected a Vishnu-pillar, in year 165 of the Gupta era, corresponding 484 CE, referring to the Gupta king Budhagupta. As this pillar inscription does not mention Toramana, therefore it is assumed that Toramana captured Eran after 484 CE, probably around 500 CE10. However, Toramana enjoyed this possession for a very short period of time. Another inscription at Eran, dated year 191 of the Gupta Era, corresponding 510 CE, mentions the Gupta king Bhanugupta fought a battle though it does not mention with whom this battle was fought. This battle might be fought against the Huna king Toramana either to defend against his invasion or to wrestle back the Gupta territories taken by him. Most probably it might be the case of recapturing the lost territories as from an another inscription the Aulikara king, Prakashadharma, we come to know that he routed Toramana in about 515 CE11. After the Guptas, the history of the town went into obscurity till the thirteenth century CE when we find many sati stones being erected in the town. More than ten such stones have been reported. Later the town went into the Mughal rule. Stone inscription of Samudragupta – Corpus Inscriptionum Indicarum Vol III – written in Sanskrit – undated – This stone inscription was found by Alexander Cunningham near the Varaha temple – The inscription mentions the Gupta king Samudragupta who is compared with Dhanada (Kubera) and Antaka (Yama) in joy and wrath respectively. A mention of setting up a temple of Janardana at Airikina to augment his own glories. Pillar inscription of Budhagupta – Corpus Inscriptionum Indicarum Vol III – written in Sanskrit -dated in year 165 of the Gupta Era (484-85 CE) – The inscription opens with a verse in praise of Vishnu whose ensign is Garuda. Then we are told that when one hundred and sixty five years had elapsed and when Budhagupta was the lord of the earth and when Surasmichandra was a protector of people protecting the province intervening between the Kalindi (Yamuna) and Narmada, this dhvja-stambha of Bhagwan Janardana was caused to be erected by the Maharaja Matrivishnu and his younger brother Dhanyavishnu, son of Harivishnu, grandson of Varunavishnu and above all the great-grandson of Indravishnu, the Brahmana sage, who was the head of the Maitrayaniya school of Yajurveda and performed sacrifices. Inscription on the neck of the boar – Corpus Inscriptionum Indicarum (Fleet’s edition) Vol III – written in 8 lines in Sanskrit in Brahmi script – dated in the first reign of Toramana – The object of the inscription is to record the building of the temple in which the present Varaha statue stands, by Dhanyavishnu, the younger brother of the deceased Maharaja Matrivishnu. Stone pillar inscription of Bhanugupta – Corpus Inscriptionum Indicarum Vol III – written in Sanskrit – dated in year 191 of the Gupta Era (510-11 CE) – This 2.5 feet tall linga was found by Cunningham12 on a high mound named Dana Bir. It was turned into a Shivalinga and was under worship when found – The inscription does not mention any reign of any particular king but mentions a certain Bhanugupta who might be not be sovereign but some king of the Gupta family. The object is non-sectarian and mentions that in company of Bhanugupta, who was a great ruler, his chieftain Goparaja came to Eran and fought a battle with the Maitras, and that Goparaja was killed, and that his wife accompanied him, by cremating herself on his funeral pyre, apparently near the place where the pillar was setup. This is probably the earliest record of Sati tradition. Goparaja is stated as the daughter’s son of the Sarabha king. On the same pillar as no 2 – this another inscription on the same pillar refers to the Saka prince, Sridharavarman. His commander Satyanaga is said to be a resident of Maharashtra. Inscription on a small varaha statue, now in Sagar University – Descriptive List of Inscriptions in The Central Provinces and Berar – written in Sanskrit – undated, dated to 5th century CE on paleographic studies – This Nr-Varaha image was found by Cunningham in possession of a local Brahman in Eran who told the former that the image was brought from the location of the Buddhagupta pillar. A short inscription near the pedestal reads two names, Mahesvara-datta and Varaha-datta, apparently two brothers who caused the statue to be made. Monuments – All the monuments of principal antiquities are located within one complex. There are remains of four-five temples, three main temples standing in single line in north to south direction. 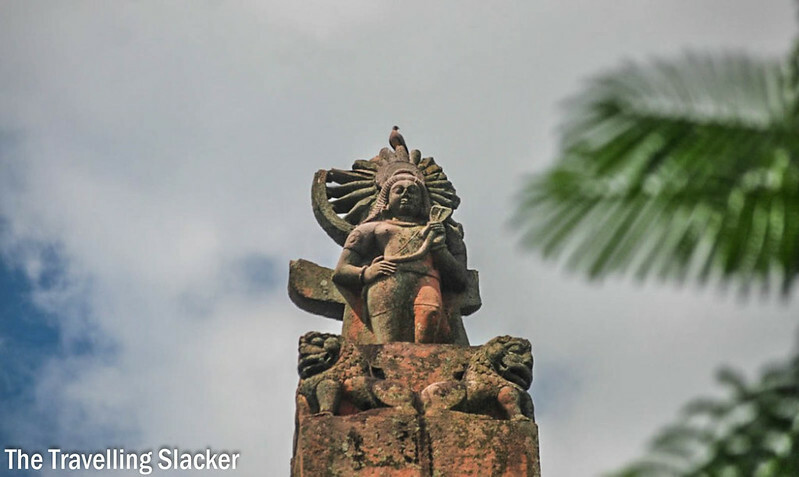 Varaha Temple – Though once this statue would be inside a small temple however now its stands below an open sky. 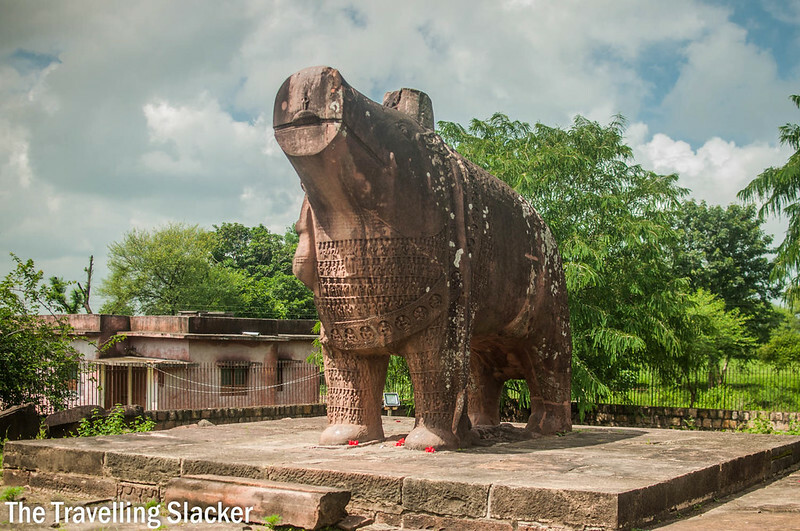 The Varaha statue at Eran is the most ancient specimen of its kind. Varaha at Ramtek might be slightly earlier than that of Eran, however the one at Ramtek is very simple representation of zoomorphic form and not the ornamented as found in later period. Varaha in its zoomorphic form is known as Yajna Varaha representing the yajna (sacrifice) with its aahutis (offerings) in an animated form. 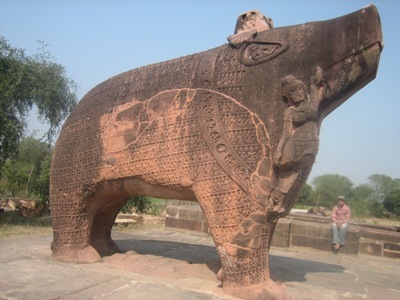 This varaha image measures about 14 feet in length, 5 feet in width and 11 feet in height15 making it the biggest such statue in India. The Varaha faces west and is ornamented with 1185 figures of sages, arranged in twelve rows, carved all over his body including legs, neck, forehead and throat16. Let us have a look on various figures found on this Varaha. A figure of Bhudevi is shown hanging with the right tusk of Varaha. A female figure, her hands on her waist, is standing in sambhanga posture at the snout of the Varaha. Rangarajan identifies her with Sarasvati while Becker17 identifies her with Vac, goddess of speech. I would be going with Sarasvati as we find the Sarasvati images on the snouts of the Varahas at Khajuraho and Dudhai. In the ears are found Vidhyadharas. A garland of twenty-eight circles is shown around the neck of the Varaha. A male and a female figure is present inside the twenty-seven circles, while one circle has a figure of a scorpion. Rangarajan suggests that these twenty-seven circles represent the those number of Hindu Zodiac signs, while the scorpion figure suggests that the figure of Varaha was installed during Vrschik Rashi period, which is an auspicious time for such activities. Four rows of male figures are shown across the throat and chest area. There are total of ninety-six figures, except the one, all are two-armed sages holding a water pot in one hand. Between the first and the second row, from top, in middle is an image of Vishnu, who is shown standing on a lotus. He is shown with two hands, but both hands are broken. Rangarajan suggests that he might be holding a gada (club) and chakra (discus). This is also the opinion of Becker. The third row on the chest shows seven male figures, the leftmost holding two lotus in his hand and wearing a tunic while the rest holding a water vessel. These are identified with the Saptagrhas (seven plantes) by Joanna Williams17. Stephen Merkel17 mentions that these Saptagrahas are the earliest representation of the seven planets. Rahu and Ketu are excluded here as the early texts mentions only the seven planets. The tunic Surya is shown wearing suggests the foreign influence as also attested by the fact that the statue was installed during the rule of Toramana. On the shoulders of the Varaha is a stump like protrusion which has four niches on its four sides. Rangarajan identifies the figures in the niches with Saumya Purusa (Vasudeva) on the west, Shiva on the south, Brahma on the north and Vishnu on the east. She quotes Ahirbudhnya Samhita, where these four figures are identified with four vyuhas of the supreme being, namely, Vasudeva, Samkarshana, Pradhyumna and Aniruddha. Joanna Williams17 suggests that this mound or stump on the Varaha’s back is a manifestation of Brahma and it might also represents a yupa or sacrificial post. Twelve rows of figures, in shape of a U, are carved along the body of the Varaha. All the twelve rows have figures of two- armed sages, holding water vessel in one hand and one hand either in abhaya-mudra or in vismaya-mudra. Legs and tail of the Varaha is also decorated with rows of sages, six rows in forelegs and three rows in hind legs. Rangarajan is of opinion that these various sages, arranged in different rows in different parts of Varaha, represents that sages of Janaloka, who witnessed the episode of Varaha rescuing Bhudevi from the depths of an ocean. Becker points to the erection of this image during the rule of the Huna king Toramana. She digs deeper into the idea and the reason erecting a Vaishnavite symbol or image in the reign of a foreign ruler. 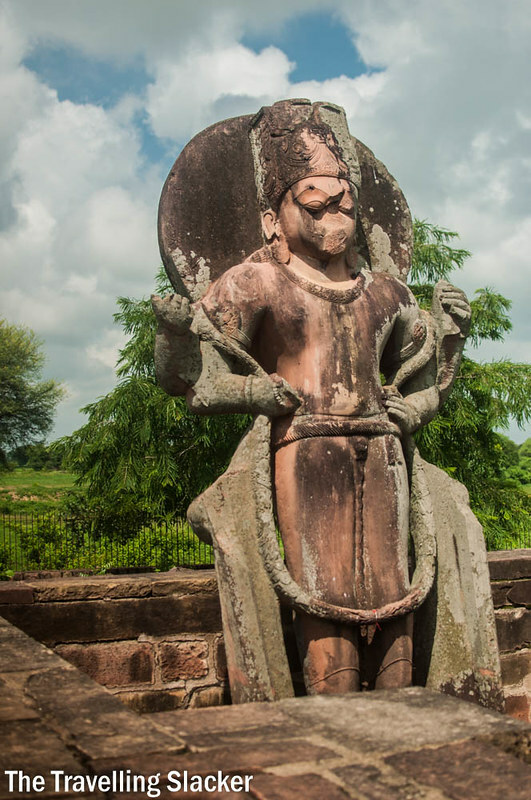 Installing a Vaishnavite image, which may be taken as an association to the previous Gupta rulers, might have brought wrath from the new Huna rulers. Though Hunas are known as barbaric and tyrant tribe, Becker tells that Toramana appears to be somewhat a tolerant ruler. Becker quotes Thakur who mentions that Toramana, a shrewd statesman and foresighted administrator tolerated various religions of his subjects in order to maintain his authority as ruler. Becker tells that the Sassanians used boar as a symbol of royal authority however she also tells that the Sassanian boar imagery cannot be linked to Toramana directly or to the style of the Eran boar except the suggestion that boar was used as a royal symbol during the fifth and sixth century CE in the west and central Asia. The two points which come to my mind are, how the donor of this statue got aware that boar could also be used as a royal symbol for the new ruler. And second is whether Toramana did not get the reading of the inscription which eulogized Narayana, a Hindu god. I believe that theory that Toramana allow some religious freedom to his subjects is more favorable here rather than Dhanyavishnu, the donor of the statue, getting an idea of using boar as Varaha as well as the royal symbol of Toramana. Vishnu Pillar – This dhvaja-stambha erected in the honor of god Janardana is about 47 feet high, resting on a pedestal of 13 feet square. It was known locally as Bhim Gada as told by Cunningham.The shaft is square at bottom and turns octagonal till the capital. Two lions, seated back to back, are carved on the abacus of the capital. The capital of the pillar is made of two human images, standing back to back with a wheel in between, one facing east and other west. 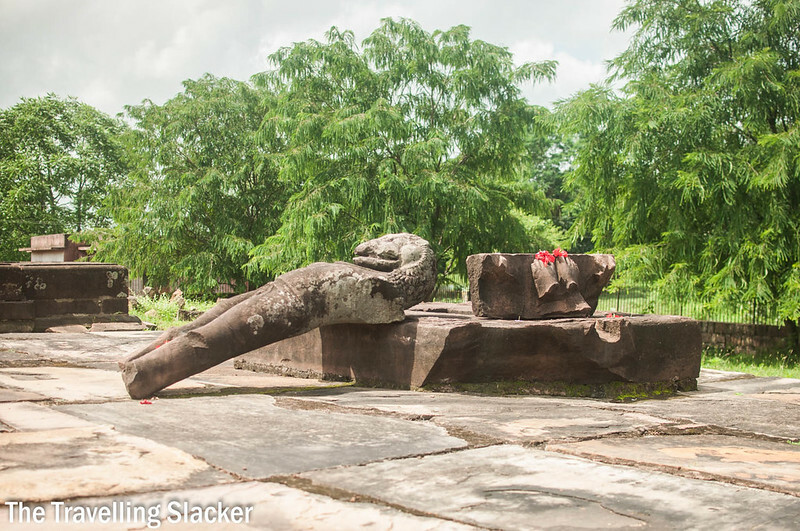 Cunningham tells that these figures were locally known as that of Rama and Lakshmana. Both the images represent Garuda. The one, facing east, shows Gardua holding a serpent in his hands which Bajpai18 takes as a representation of a crushing defeat of the Sakas under the Gupta emperor Chandragupta II. As Garuda is associated with serpents, as an enemy, it is not surprising to see him holding a serpent. Whether there is any political agenda behind this posture of course is a matter of conjecture. As per an inscription, this pillar was erected by brothers Matrivishnu and Dhanyavishnu during the rule of the Gupta king Buddhagupta. Matrivishnu was referred as a king which suggests that he was ruling under the patronage of the Gupta emperors. 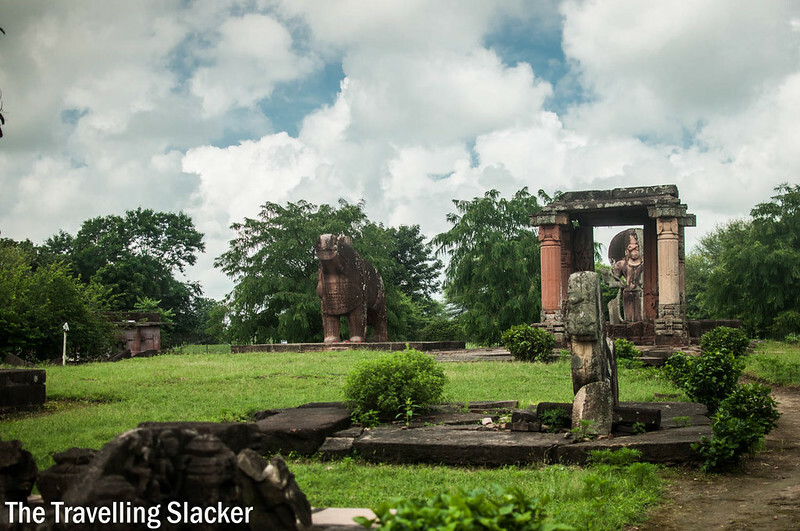 Narasimha Temple – This temple was probably only consisted of a sanctum and mandapa, former 12.5 feet long and about 9 feet wide as Cunningham mentiuons. Now only a damaged statue of Narasimha is what remains of this temple. It is broken below its knees, however its pedestal was in it situ when Cunningham visited. Now the pedestal is also lying on the platform. The pedestal has the remain of feet of Narasimha. It would have been a 7 feet high statue in its original glory. The iconography is interesting as such this is a kevala-Narasimha image, shown standing but not in action. The mouth wide open shows an amiable appearance rather than the rudra aspect as witnessed in other icons. Vishnu Temple – This is the best preserved temple at the site. Though its roof is fallen however its sanctum doorway is intact with its decoration. Cunningham suggests that, when complete, it would have measured 32.5 feet long and 13.5 feet wide while its interior dimensions would be 18 feet by 6 feet. Two pillars, 13 feet high, still standing in front of the sanctum suggests that a roofed mandapa adorned the temple. Only the pillars have survived, the walls between are all fallen. An image of Vishnu, 13 feet high, is placed inside the sanctum. This image was known as an image of Bhim Sen by the locals as mentioned by Cunningham. The sanctum doorway has river goddesses, Ganga and Yamuna, at the door jambs. 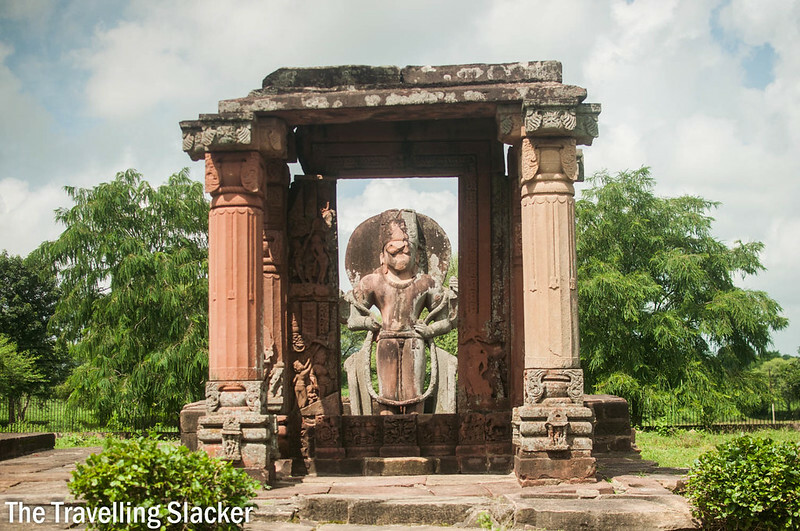 Usually these river goddess are found at the upper part of the door jambs, at the terminals, in the Gupta period temples. Krishna Deva20 seems to agree here stating that the sanctum doorway and the front mandapa was installed during the Pratihara period of 8th-9th century CE. Dvarpalas are present at the pilasters on either side of the door. Food and Accommodation – Eran is a small village, you will not find any place to stay and eat. Mandi Bamora is the nearest big town, however that also does not offer good staying options. 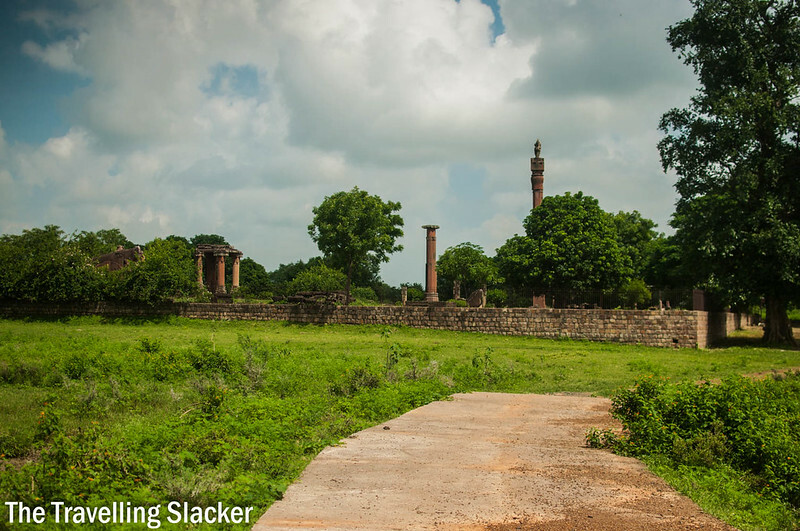 Best would be that you stay at Sanchi and visit Eran as a day trip from there. Mandi Bamora railway station and nearby area gives some options for food. How to reach – Mandi Bamora is a railway station on Bhopal-Bina railway line. Eran is about 15 km far from here on eastern side. You can either ask some auto rickshaw or take lift from people going towards that village. There is no direct bus to Eran, buses going to Khurai will drop you at the crossing to Eran, from where it is about 5 kms. Agrawala, V S (1977). Gupta Art. Prithivi Prakashan. New Delhi. Bhandarkar, D R (1981). Corpus Inscriptionum Indicarum Vol III. Archaeological Survey of India. New Delhi. Brown, Percy (1959). Indian Architecture (Buddhist and Hindu Periods). D B Taraporevala. Mumbai. Deva, Krishna (1969). Temples of North India. National Book Trust. New Delhi. ISBN 9788123719702. Grant, Charles (1870). The Gazetteer of the Central Provinces of India. Education Society Press. Bombay. Harle, J C (1974). Gupta Sculpture. Munshiram Manoharlal. New Delhi. ISBN 8121506417. Lal, Hira (1916). Descriptive List of Inscriptions in The Central Provinces and Berar. Government Press. Nagpur. Mishra, S N (1992). Gupta Art and Architecture. Agam Kala Prakashan. New Delhi. Sampath, M D (2001). Epigraphs of Madhya Pradesh. Archaeological Survey of India. New Delhi.